President Donald Trump poses for a photo after signing Title X, the Congressional Review Act, on April 13, 2017, in the Oval Office. 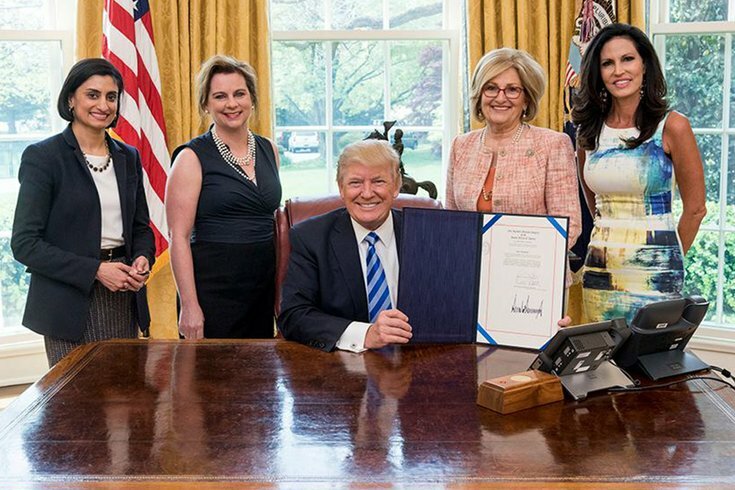 With him are, from left, Seema Verma, administrator of the Centers for Medicare and Medicaid Services; Marjorie Dannenfelser, president of Susan B. Anthony List; Rep. Diane Black of Tennessee, chairman of the House Budget Committee; and Penny Nance, CEO and president of Concerned Women for America. The federal family planning program, known as “Title Ten,” is named for its section in the federal Public Health Service Act. It became law in 1970, three years before the Supreme Court legalized abortion in Roe v. Wade. The original bill was sponsored by then-Rep. George H.W. Bush (R-Texas) and signed into law by President Richard Nixon.